I blame They Might Be Giants. And of course there’s the little matter of Apple’s culpability for the iPod to take into account. Does It Help When You Close Your Eyes? Jean Smith is primarily known as a woman of words in the acclaimed, literary rock duo Mecca Normal (her band with David Lester) and as the author of three novels. A segment of her forthcoming novel “Living On Eggshells” is on McSweeney’s Web site. Painting is an integral component in Jean’s creative life, providing a word-free balance. Recent themes in Jean’s visual work include alcoholism, how women and girls perceive themselves, and Native land claims issues. A 20-year participant in underground culture, Jean continues to succeed at making a positive social impact by creating an atmosphere intended to inspire self-expression. Let’s start out with the big number. You’re coming up on the 20th year of Mecca Normal’s existence. That’s a lifetime on a regular job, and an eternity in the world of pop music. What are some of the most important things you’ve learned in all that time? How do you manage to stay interested (and interesting)? When you say 20 years, it sounds like a long time, but I remember our first show vividly. I figured memories from that long ago would have a distant sense, but they don’t. This is a good thing, but it also makes experiences feel compressed. Because I avoided many standard milestones and pitfalls of mainstream life, I measure my accomplishments by unusual standards: single, no kids, no post-secondary education, no job, and I don’t own a house or a car. This doesn’t sound like a huge success, but to me it is. Getting older as an artist (musician, writer and painter) is different than other ways of going through life. I have not been worn down by the world; I feel my best work is ahead of me. I am healthier and stronger than ever, resulting in less dissatisfaction requiring an outlet; this intrigues me. It can be regarded as a shift in motivation and a time to allow new perspectives to surface — all very interesting, but not essentially part of the typical rock aesthetic. I trust what I am doing as a person and an artist. I have become comfortable with allowing my mind to work on ideas, on levels of thought that I’m not controlling. I’ve noticed that thinking about situations, going over details and considering possible ways to approach projects, can have tangible results. A course of action can be set and left to operate on its own. In previous years, I felt I had to be 100 percent at the helm of everything; I’m currently implementing patience and acceptance. Simultaneously, I’m honing my business aesthetic. Managing how we proceed is part of the art. For the most part, I feel connected to a group of people who will always be about 10 years younger than myself. Maintaining a band for 20 years, as a way to document the lives of two artists, is a project that is currently defining itself with more clarity than ever. Mecca Normal had a blip of popularity a number of years ago, but we didn’t want to become something other than what we started out as — a guitar and a voice paired up to interpret ideas and experiences. Better that it goes on as such, and not as any sort of imitation of a concept long out of play. Every superhero has an origin story, and after a while, you get tired of hearing them. I’m led to believe, though, that Mecca Normal’s is more intriguing than, well, normal. Care to give it to us? Mecca Normal, at any point in its history, reflects its origin. I’m looking for a part-time job; Dave (Lester) reminds me that this is not the end of everything. It is a way to solve a certain set of problems, and later, things will be different. I find every day is slightly different than any other day; even though I am still here, in this room, it feels very different than yesterday in this room. The beauty of Mecca Normal was recently brought to my attention (by Dave) — we are very different people. I don’t recall thinking we were the same or different. In my mind, we just were. But the clarification is interesting. On the creative front I need something to work with, something to modify, manipulate, add to, edit, change; to react and respond to. David is more comfortable coming up with completely new ideas, from nothing. Music is communication where men and women can participate at the same time, and a entirely new construction results. When two men do this, it’s called fishing — not talking, simply involved in the artifice of fishing, while feeling an innate connection. What’s been the most rewarding aspect of Mecca Normal — and conversely, what’s the most difficult or frustrating? We recently integrated most of what we do around Mecca Normal performances. Our events include an art show (both of us are strong visual artists), and something called a workshop. I wanted to incorporate information we might normally put across in interviews. We have a lot of ideas that were beginning to feel separate from the songs. The words reflect a personal level, but we want to talk about other things. The songs are beautiful and powerful and illuminating in a whole other way, but I have very specific things I want to get across about what it is really like to be an artist for 20 years, a musician completely out of the mainstream, an author entirely responsible for sorting out the publishing of her novels. We are talking about the importance of underground culture. We have had lots of help from our fantastic labels over the years — Kill Rock Stars, Matador and K contributed so much. No one has tried to turn Mecca Normal into anything other than what it is. Those are the rewarding aspects. The frustration comes when anything gets in my way. I’ve been trying to find a job … trying to keep a long-term perspective while absorbing the fact that jobs screw up other things. I realize I’ve had it pretty good. I mean, the way it goes, there is tons of work around all these projects, and no time left to make any money. So things are sort of out of balance. Jobs so far have included giving out samples of booze in liquor stores (interesting, as a non-drinker of four solid years), taking old gas lawn mowers in for a rebate on new electric models for the Clean Air Foundation, and tomorrow I start some market research survey in a mall. Just got in from that interview. So my head is whirling, thinking about job details and all the turmoil that goes along with it. It’s brutal in a way that I had no plans to re-acquaint myself with. Other frustrating things include dating, and people assuming that I am very serious and closed, and that I don’t need or want any outside influences. Mecca Normal is a real multimedia entity. In addition to music, you incorporate artwork into your performances; you’re a publicist for a number of other artists; and you’ve written short stories and several novels which are as challenging and interesting as your songs. Talk about how you integrate all these cultural endeavors. When we started adding things to the tours, the art shows and workshops, I wondered if it would be too much. As it has turned out, that wasn’t the difficult part. What gets to me is the slow rate of success with anything because the work is so spread out. As a follow-up, tell me about the multimedia show Mecca Normal is going to curate this September in Vancouver. David and I are co-curators of a group art show on Sept. 28 at the main library. Our show is called “Does It Help When You Close Your Eyes?” a component of a literary event called Word On The Street. The art show — five Vancouver artists, including ourselves — will be up for one day only. Mecca Normal will perform spontaneously and present portions of the workshop “How Art and Music Can Change the World” as people come and go from our gallery space. We are organizing more events, and contributing to existing events in a similar way, by finding appropriate artists, writers, artists to present their work. My series of paintings for the art show is called “We Live On Indian Land” — an interpretation of what it might have been like when the white people showed up around here. 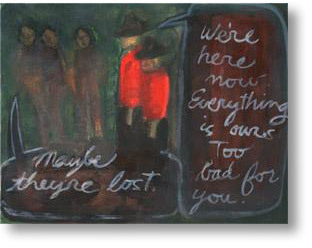 I’ve included one painting from the series “We’re Here Now. Everything Is Ours. Too Bad For You.” I want to have a lot of these out in various locations (restaurants, clubs, cafes, galleries) for the 2010 Winter Olympics. Actually, we had “We Live On Indian Land” written on the inner groove of our first LP. Your other band, 2 Foot Flame, shares personnel with Mecca Normal, but is very distinct in sound. What’s the status of 2 Foot Flame as an entity? What’s the process for deciding which group performs which material? Peter Jefferies and I started 2 Foot Flame when we were living in New Zealand; Michael Morley graciously added guitar elements. Matador released the first album and the three of us toured in the U.S. The next U.S. tour, Dave was standing in for Michael. Peter was Mecca Normal’s drummer and doing his solo set, so he was in all three bands on the bill. He barely had time to smoke! Peter and I then toured as a duo version of 2 Foot Flame in the U.S., New Zealand and Australia. I played guitar and sang, and Peter played drums and keyboards (at the same time). 2 Foot Flame songs are distinctly different than Mecca Normal songs: they’re keyboard-driven, leaving the guitarist free to add accents and texture. There is an unreleased 2 Foot Flame album, recorded in New Zealand after our last tour. You’re renowned for your confrontational live shows. How do you manage to confront and challenge your audience while making sure you’re being heard? What’s the key to being challenging and delivering an important message without being alienating? I don’t see myself as confrontational. I may be loud and dynamic and intense, but there is typically an element of humor in our performances. I think the quality of the music, the content of the songs and that the way Dave and I work together are intriguing. I can’t think of a song in the last eight years in which I have been intent on delivering a message. If people are taking away messages, that’s up to them. I’m sure there are as many perceptions of me as there are people who have encountered me. I am, for the most part, inspired, joyful and positive. Addressing social issues from the stage is a gracious way to induce thought. I’m not yelling in anyone’s face. I am a beautiful singer, singing a constant flow of beautifully stimulating ideas. By the time people are listening to what we’re doing, they tend to know what they’ve gotten into. We get a lot of support from people who find what we do to be a way of refueling. We’re not trying to get everyone to like us; we’ve always seen ourselves as a comparative element. Once, a guy came up to me at a show and said he only listened to Mecca Normal. I forget what I said, but I was thinking that was just weird. Mecca Normal is like parsley. It lays on the side of your plate being green, a statement, a decoration. Eat it to impress someone, ignore it, turn your nose up at it, chop it up and throw it in a salad. Dave and I are working new songs and finding new places to play, to speak about why we do what we do, and to show art. After almost 20 years of monitoring Mecca Normal’s significance within each new generation of music-lovers, I want to broaden our base to include other kinds of activists working to make a positive social impact. Underground culture is an essential component within society’s infrastructure. I hear of cities where all ages shows are basically against the law, where physical spaces to play music are limited, and activists (current and potential) lose out on face-to-face interaction and the honing of organizational skills. Who will create art and music that challenges the corporate agenda if there is nowhere to present it? Shows are where musicians and artists assess the impact of their work, and fine-tune thinking. Where writers and painters and activists meet and get new ideas. If there is no exchange of ideas and feedback, if the cycle of giving and receiving inspirational energy is diminished, if we don’t meet people who respond to our work, if we aren’t building alliances in real life, then how are the basic aspects of culture are being subverted and denied, and how will this reduce our ability to resist when it is necessary to do so? On a related note, your lyrical subject matter is fiercely political, but with an intensely personal approach. Is that a difficult balance to achieve? Actually, if I may disagree with you again, my lyrics aren’t fiercely political. I sometimes feel they should be more political — that that is what I’m supposed to be doing. If there’s anything political going on now it is my willful evolution as a person. I reveal vulnerability and document the process of living without caving in to what people expect of me. And, as it turns out, longevity itself has become a political issue. I just read a review that said “retire already.” Um, no. How does your fiction writing inform your music, and vice versa? Longer pieces of writing form the novels, but are often trimmed and whittled into songs. Simple ideas for songs are expanded to go into in the novels. It’s a great process where everything has the potential to be stretched or compressed. The next book is 20 year’s worth of stories in the underground music scene. Tell us something about Jean Smith, the fan. What do you like to read, to watch, to listen to? Is there a particular common quality in the art you enjoy? I spend a lot of time alone, thinking, writing, but I operate within a band, with a partner. So there is a balance. I am interested in musicians who work primarily on their own — self-directed iconoclasts who are propelled by some sort of invisible force. I don’t tend to give lists of writers, bands, influences. It feels like a loaded calculation meant to create an impression. Find me on Friendster and see how it adds up. Finally, tell me about Jean Smith’s greatest road-food moment, her diner epiphany. Bringing Tabasco sauce on tour was a turning point. Free samples — olive tasting in Williams, Calif. Andersen’s Pea Soup between L.A. and Sacramento. We had a print-out of all Cracker Barrels on one tour. I used to eat liver and onions quite a bit. Then there were the soup tours. With a few super long drives, and all the extra work of putting up art shows on the last tour, there were a few chocolate bar dinners. Link: Mecca Normal’s Web site is at mecca_normal.tripod.com.